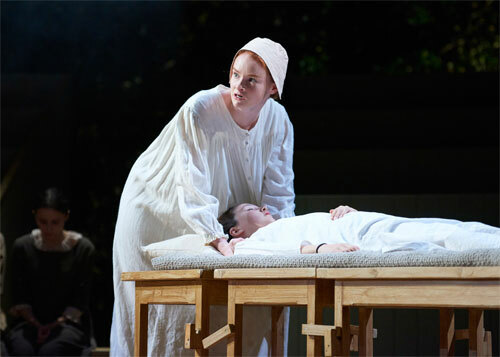 Although it was no doubt the bane of many other students’ lives, I remember absolutely loving Arthur Miller’s The Crucible as a teenager and read my copy several times over. Actually, as an aside, when I recently moved house and had to pack and then unpack all of my books again, I was a bit mortified to notice how low brow my more recent reading material seems in comparison to the sort of thing that I was reading as a young adolescent when I was devouring the likes of Ulysses, The Crucible, War and Peace and even several Balzac novels in the original French. I suppose it must be true that we get less intelligent as we age or maybe I was just more of an annoying little precocious brat back then. Or possibly both. 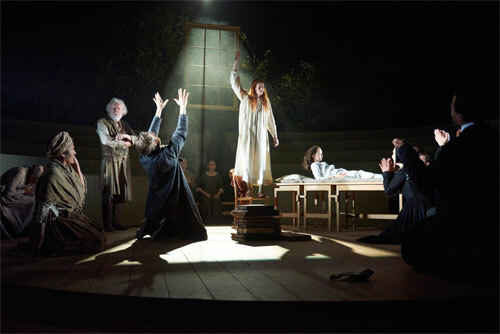 Anyway, although I love The Crucible I have always been sad about the fact that I have never managed to see it on stage even though I absolutely love my trips to the theatre. I’ve seen the film version, of course, with Winona Ryder and Daniel Day Lewis simmering at each other in corners, but that just made me want to see it done ‘properly’ even more. 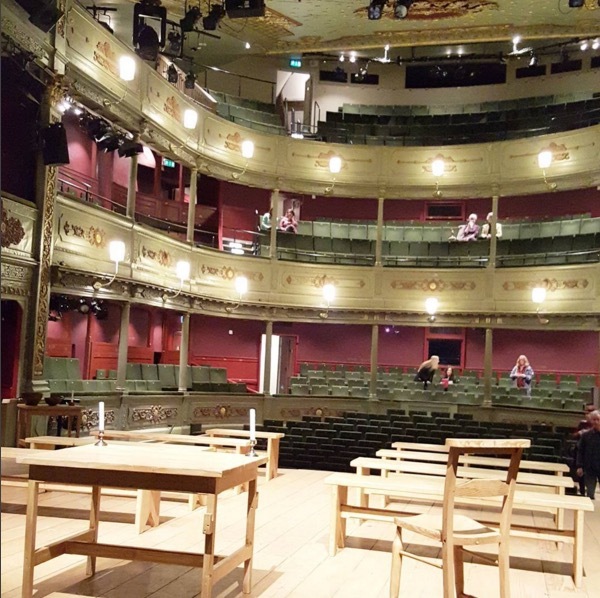 I was utterly thrilled, therefore, when I heard that the Bristol Old Vic were planning a production of The Crucible to commemorate not just Arthur Miller’s hundredth birthday but also the fact that this venerable old west country theatre played host to the British premiere of his play in 1954. Before we went along, I saw someone on Twitter mention that some of the audience were seated on the stage so that they formed a sort of silent ‘jury’ during the play and, naturally, I wistfully hoped that we would get the opportunity to do this even though my husband, who is a much more retiring type than me, instinctively recoiled from the prospect. I was delighted therefore when the lovely Charlie, who is press officer at the Old Vic, informed me that she had indeed secured us both seats on the stage! Such joy. Not only was I finally getting to see The Crucible on stage for the very first time but er I was going to be on stage too. I think that MORE than compensates for all those years that I spent with it languishing at the top of my theatrical wish list. As we settled into our seats, which were at the front row of a pair of tiered rows, which looked very much like those you can find in old style court rooms or lecture theatres, I was struck by the strong scent of pine from the ‘forest’ behind us which instantly evoked the wilderness that was seventeenth century Massachusetts. I also, rather ruefully, remembered all the times that we have sat in the pit of the Old Vic before a play starts and watched the cast get into character on stage. I’ve always really enjoyed this in the past but it was extremely disconcerting to realise that WE were the ones being stared at by the rest of the theatre. Needless to say, I was EXTREMELY meticulous about switching my phone off and, remembering the infamous Downton Abbey promo photo, made sure that I hid my jarringly modern looking plastic bottle of water WELL out of sight. 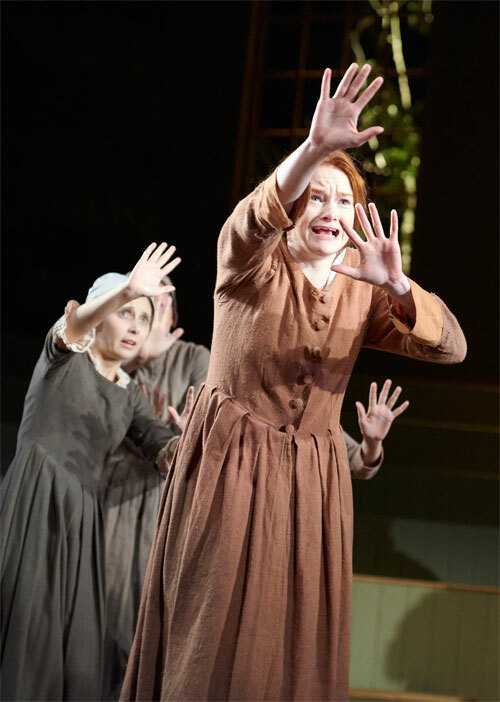 When Arthur Miller originally wrote The Crucible in the 1950s he intended it as a reflection on the current American hysteria about Communism and the ‘witch hunts’ that were going on at the time. However, although the years have marched relentlessly on since those days, things haven’t really changed all that much. In fact, if anything, it’s got worse now that social media has effectively made the world a smaller place and given us all platforms to judge and be judged. While audiences in the fifties would have mused about Communism and McCarthyism, I found myself thinking about the public pillorying that goes on online, the scapegoating and scaremongering in politics and the relentless hounding of public figures – none of which is rarely motivated by any genuine desire to do good and usually says a lot more about the accuser and jury and their prejudices than it does about the accused. From my unique vantage point on the stage, I felt close to the action and it was entirely reminiscent of watching a scrap playing out on Twitter or Facebook, where we watch in silence as another reputation is dragged through the mud. The Old Vic production was powerful, emotional and energetic but seeing it from the stage, from within the hallowed theatrical stamping ground, gave it a haunting, visceral quality that made it impossible not to feel directly involved and culpable in both the accusations and the resulting judgement as a group of young girls fake demonic possession and, enjoying the unprecedented attention of the village elders, end up accusing half the locals of witchcraft. There are darker motivations at work too than simple adolescent mischief making as the tensions that simmer beneath the apparently tranquil surface of Salem are revealed to us one by one – adultery, betrayal, avarice and envy as the lid is well and truly blown off by the accusations of the fiery haired Abigail Williams and her friends. There is a great deal of significance placed on the accused knowing their Commandments and although most pride themselves on being true Christians, it’s clear that very few of them have been living up to the perfect piety that their community demands and it is this base hypocrisy that lies at the very heart of The Crucible that is perhaps the strongest link between the events in Salem in the late 17th century, the McCarthyism of the 1950s and the slavish fascination with chipping away at the clay feet of our idols and the baying online mob mentality that is a rot at the heart of modern day society. 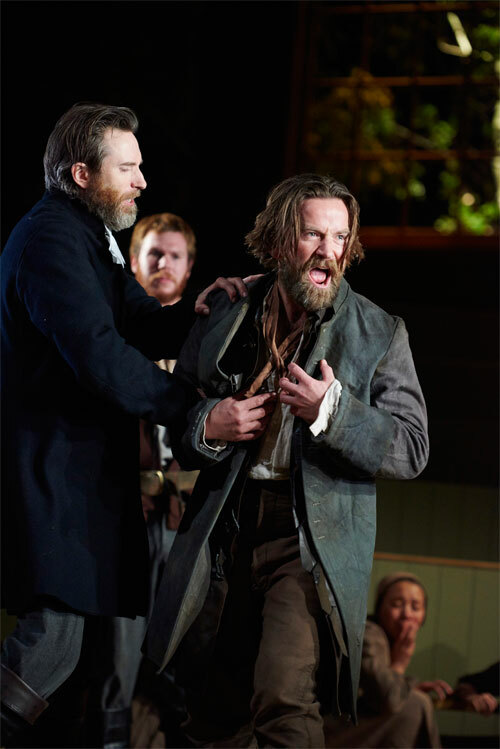 As always, this Old Vic production attracted a talented and impressive cast who did amazing justice to Miller’s play. I was particularly impressed by Rona Morison’s impassioned Abigail Williams, David Hargreaves’ gently humorous Giles Corey and the quiet dignity of Kika Markham’s Rebecca Nurse. 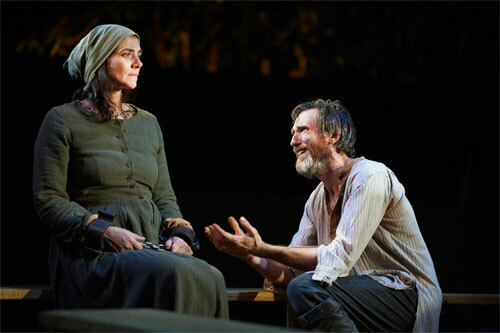 Most astounding of all though were the performances of Dean Lennox Kelly as John Proctor and Neve McIntosh as his wife Elizabeth, whose marriage and clear and profound love for each other forms the heart of the play as well as sowing the seeds for the dramas within it thanks to Proctor’s unwise assignation with their infatuated former maidservant Williams and his wife’s dignified forbearance of his transgression. It wasn’t until almost the end of the play that I realised why Neve McIntosh looked so familiar – she plays Madame Varta in Doctor Who and when I found out that Dean Lennox Kelly played Shakespeare in the same series, I couldn’t help but think of all the wasted slash fic opportunities. Once again, a superb, thrilling, haunting and thoroughly engrossing performance at the Old Vic and one that must surely be unmissable for any theatre fans. I would definitely recommend booking a seat on the stage if you can as it makes for a truly amazing and unique experience that plunges the audience directly into the heart of the action, especially during the trial scene when the house lights are left on and you really do feel like the jury. Despite his reservations, my husband ended up loving it – he’s always really fascinated by the stage design of the things that we go to see so really appreciated being a part of it! Many thanks as always to the Bristol Old Vic press team for the tickets! All production photos are by Geraint Lewis and courtesy of Bristol Old Vic. 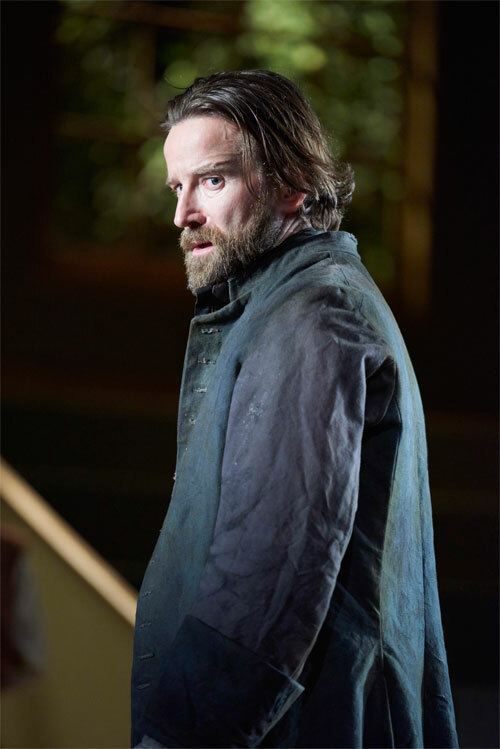 The Crucible is on at Bristol Old Vic until the 7th of November. Ps. Good lord, just realised that Reverend Hale was played by Daniel Weyman from Foyles War (he’s Sam’s husband). This is one of the things that I love about going to the theatre.